A cold, blustery Thursday night in February brought a hot topic to the table: research. 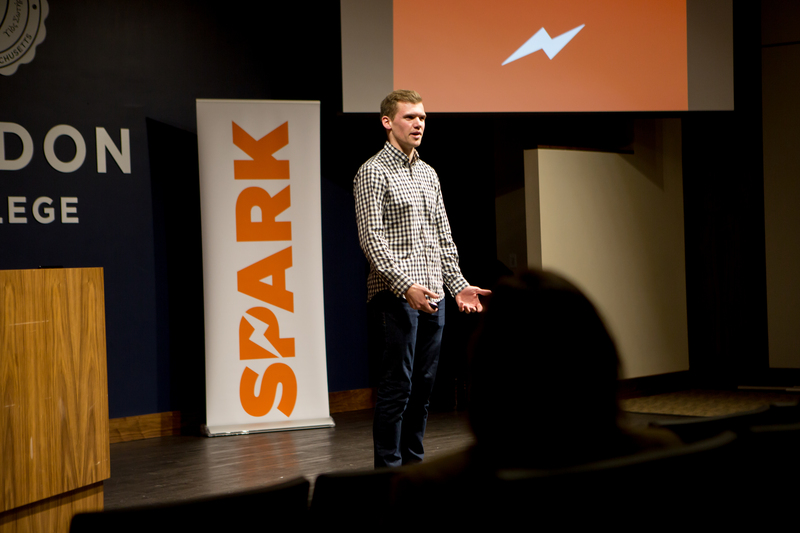 In Jenks’ Gregory Auditorium Sam Mason ’15, president of the Undergraduate Research Council (URC), presented “Spark,” a new TED-talk style event featuring three faculty members. Mason began by explaining the URC’s six-step checkpoint process for students interested in obtaining funding for research (select a topic of interest, find a conference, apply to URC, receive funding for a conference, attend a conference, share findings with Gordon community). The three professors then came to the podium, an orange banner with a white lightning bolt serving as their backdrop, to deliver 12-minute talks about their personal research, with the hope of sparking the audience’s interest in pursuing research. No professor captured the “frontier” theme more literally than biology professor Dr. Greg Keller in his presentation, “The Last Great Ecological Frontier: Your Backyard.” Infusing a touch of humor into the academic event Keller kept his audience—biology and non-biology majors alike—engaged and chuckling. “There is no better way to look like a dork than to be in the woods with a voice recorder saying ‘hop, hop, flight, hop, fall, flight,’” he declared. But that is exactly what Keller does in his study of migratory birds. Keller also spoke about the work of current biology undergraduates, such as Mason. In his fieldwork, Mason catches mice and extracts DNA from their ears while they are anesthetized. Keller and Mason have found that the mice in our backyards are carrying the same bacterial Lyme diseases as humans. Vanborre encountered these contradictions after her mission trip to Haiti with a group of Gordon students, which left her with many questions, she said in her presentation. “How can fiction carry the death and the memory but also the hope and survival (following a traumatic event)?” Vanborre wondered. “I thought this was a really marketable topic. And you might be saying, ‘Oh, what’s that?’” Bird said to a flutter of laughter. Bird compared the origins of the Greek New Testament and The Iliad to highlight the textual evolutions of one of Homer’s classics. “With the Greek New Testament, the earlier you go back all of the manuscripts seem to point towards a fixed text. With The Iliad, it seems to be the further back you go, the more variation there is in the text,” Bird explained.